This paper presents a distributed receding horizon filtering algorithm for multisensor continuous-time linear stochastic systems. Distributed fusion with a weighted sum structure is applied to local receding horizon Kalman filters having different horizon lengths. The fusion estimate of the state of a dynamic system represents the optimal linear fusion by weighting matrices under the minimum mean square error criterion. The key contribution of this paper lies in the derivation of the differential equations for determining the error cross-covariances between the local receding horizon Kalman filters. The subsequent application of the proposed distributed filter to a linear dynamic system within a multisensor environment demonstrates its effectiveness. The concept of multisensor data fusion is the combination of data generated by a number of sensors in order to obtain more valuable data and perform inferences that may not be possible from a single sensor alone. This process has attracted growing interest for its potential applications in areas such as robotics, aerospace, and environmental monitoring, among others [1, 2]. In general, there are two fusion estimation methods commonly used to process the measured sensor data [3, 4]. If a central processor directly receives the measurement data of all local sensors and processes them in real time, the correlative result is known as the centralized estimation. However, this approach has some serious disadvantages, including bad reliability and survivability, as well as heavy communication and computational burdens. The second method is called distributed estimation fusion, in which every local sensor is attached to a local processor. In this method, the processor optimally estimates a parameter or state of a system based on its own local measurements and transmits its local estimate to the fusion center where the received information is suitably associated to yield the global inference. The advantage of this approach is that the parallel structures would cause enlarge the input data rates and make easy fault detection and isolation [1–5]. Recently, various distributed and parallel versions of standard Kalman filters have been reported for linear dynamic systems within a multisensor environment [6–10]. To achieve a robust and accurate estimate of the state of a system under potential uncertainty, various techniques have been previously introduced and discussed. Among them, the receding horizon technique is popular and successful, due to its robustness against temporal uncertainty, and has been rigorously investigated. The receding horizon strategy was first introduced by Jazwinski, who labeled it as limited memory filtering . The dynamic system without the process noise is believed to describe the efficiency of the idea through the maximum likelihood estimation scheme . Following this, the optimal FIR filter for time-varying state-space models was suggested by W. H. Kwon et al. . FIR filters make use of finite input and output measurements on the most recent time interval, called the receding horizon, or a horizon which is a moving, fixed-size estimation window. Because of the complicated structure of the FIR filter, a modified receding horizon Kalman FIR filter for linear continuous-time systems was proposed in . 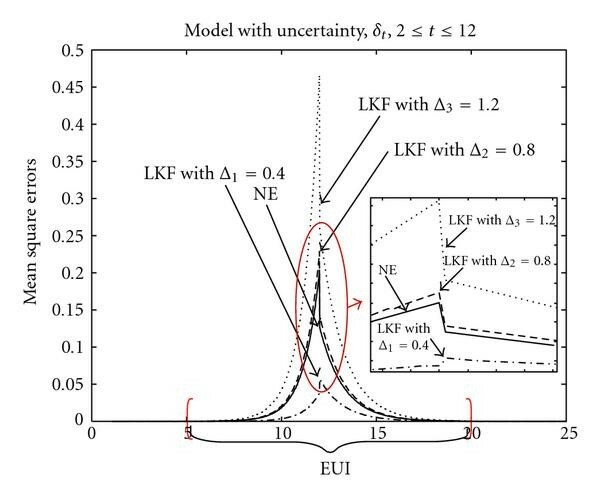 As a general rule, the local receding horizon Kalman filters (LRHKFs) are typically more robust against dynamic model uncertainties and numerical errors than standard local Kalman filters, which utilize all measurements [14–17]. Distributed receding horizon fusion filtering for multiple sensors with equal horizon time intervals (horizon lengths) has also been proposed in . In this case, all LRHKFs with the same horizon time interval, which are fused, utilize finite measurements over the most recent time interval [12–16]. In this paper, we consider the generalization of  for arbitrary, nonequal horizon lengths. Design of distributed filters for sensor measurements with nonequal horizon lengths is generally more complicated than for equal lengths due to a lack of common time intervals that contain all sensor data, making it impossible to design a centralized filtering algorithm. We propose using a distributed receding horizon filter for a set of local sensors with nonequal horizon lengths. Also, we derive the key differential equations for error cross-covariances between LRHKFs using different horizon lengths. The remainder of this paper is organized as follows. The problem setting is described in Section 2. In Section 3, we present the main results pertaining to the distributed receding horizon filtering for a multisensor environment. Here, the key equations for cross-covariances between the local receding horizon filtering errors are derived. In Section 4, two examples for continuous-time dynamic systems within a multisensor environment illustrate the main results, and concluding remarks are then given in Section 5.
where is the state, is the measurement, the system noise and the measurement noises , are uncorrelated white Gaussian noises with zero mean and intensity matrices and , respectively, and , , and are matrices with compatible dimensions. Also, the superscript denotes the th sensor, and is the total number of sensors. Now, we will show that the fusion formula (FF) [10, 17] is able to serve as the basis for designing a distributed fusion filter. A new distributed fusion receding horizon filter with nonequal horizon lengths(NE-DFRHF) includes two stages. In the first stage, LRHKFs (estimates) are computed and then linearly fused at the second stage based on the FF. where the number of a local subsystem is fixed. where is the identity matrix, and are the time-varying weighted matrices determined by the mean square criterion. Theorem 1 (see [10, 17]). The derivations of (13)–(17) are given in the appendix. Thus, (5)–(17) completely define NE-DFRHF. with the horizon initial conditions and gains determined by (5)–(7), respectively. The LRHKFs , can be separated for different types of sensors. In other words, each local estimate can be found independently of the other estimates. Therefore, LRHKFs can be implemented in parallel for different sensors (2). Note, however, that the local error covariances , and the weights may be precomputed, since they do not depend on the sensor measurements (3), but rather on the noise statistics and and the system matrices , , and , which are the part of the system model (1), (2). Thus, once the measurement schedule has been settled, the real-time implementation of NE-DFRHF requires only the computation of the LRHKFs , and the final distributed fusion estimate . 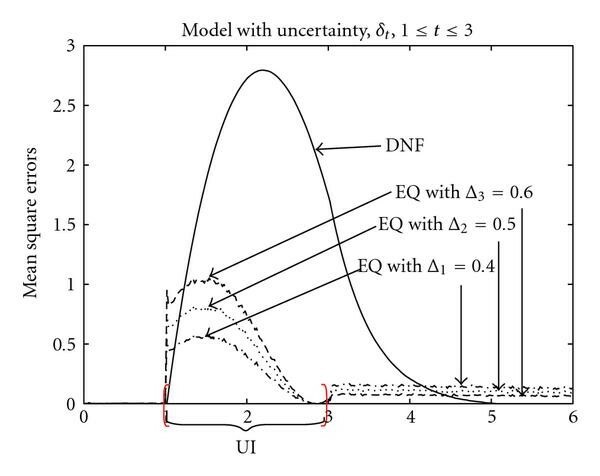 In this section, two examples of continuous-time dynamic system with parametric model uncertainty are presented. In both cases, the local and final fusion estimates are biased. Nevertheless, these examples demonstrate the robustness of the proposed filter in terms of mean square error (MSE). The first example demonstrates the effectiveness of the distributed fusion receding horizon filter for different values of horizon lengths, and the second provides a comparison of the proposed filter with its nonreceding horizon version . Example 5 (aircraft engine model). where is an uncertain model parameter, and is a white Gaussian noise. The initial values are , and The system noise intensity is and the uncertainty is for the interval . where , are white Gaussian noises with intensities , . Our point of interest is the behavior of the aforementioned filters, both inside and outside of the uncertainty interval . 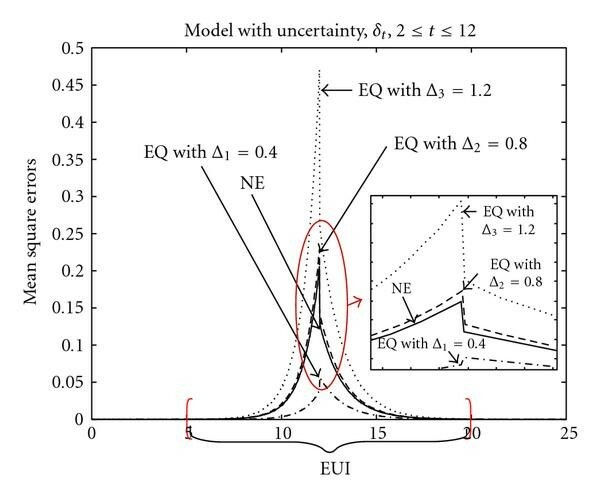 Since the uncertainty has little effect on the behavior of the filters (estimates) after the extremity of interval , for convenience of the MSE analysis, we introduce the extended time-interval , referred to as the Extended Uncertainty Interval (EUI). According to the simulation results, and . Figure 1 compares the MSEs of NE-DFRHF ("NE") with three EQ-DFRHFs ("EQ") with common horizon lengths , . The reason for such a robust property (22) is to compensate for the given uncertainty , as the common horizon length for all local sensors (common memory of LRHKFs) should be minimal. In this case, it is equal, as . It should also be noted that the reduction of the horizon length to zero inside the uncertainty interval is impossible due to the loss of sensor measurements (3). The problem in finding the optimal horizon length for each individual LRHKFs is quite complex. Since, in actual situations, the uncertainty interval is unknown in advance, the MSEs relation (26) proves NE-DFRHF to be the best choice among the other filters. MSEs comparison between NE-DFRHF and three EQ-DFRHFs inside the EUI. MSEs comparison between NE-DFRHF and three LRHKFs inside the EUI. Example 6 (water tank mixing system). Summarizing the simulation results in Figure 5, EQ-DFRHF has a parallel structure and allows parallel processing of observations, thereby making it more reliable than the others since the remaining faultless sensors can continue the fusion estimation if some sensors become faulty. Moreover, EQ-DFRHF can produce high-quality results in a real-time processing environment. MSEs comparison between DNF and three EQ-DFRHFs. In this paper, we proposed a new distributed receding horizon filter for a set of local sensors with nonequal horizon lengths. Also, we derived the key differential equations for determining the local cross-covariances between LRHKFs with the different horizon lengths. Furthermore, it was found that NE-DFRHF can complement for robustness and accuracy when a common time interval containing all sensor data is lacking. Subsequent simulation results and comparisons between NE-DFRHF and other EQ-DFRHFs and LRHKFs verify the estimation accuracy and robustness of the proposed filter. This work was supported by ADD (contract no. 912176201) and the BK21 program partly at Gwangju Institute of Science and Technology. where the nonzero element in (A.7) and (A.12) represents the covariance of the state , which is determined by the Lyapunov equation (7). This completes the proof of Theorem 2.